As I mentioned in the last post, I have acquired a copy of the new Introductory Boxed Set for the 4th edition of Dungeons & Dragons. The packaging of this new boxed set is based on the 1980s "Mentzer" Red Box Basic D&D Set that TSR published in 1983 -- it even uses the same cover art. 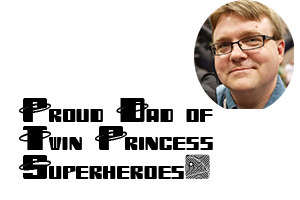 Wizards of the Coast has two hopes for the product. First, the are hoping that the product serves as a key introductory product for a new generation of gamers and that this Red Box will be as important to these new gamers 17 years from now as the old Red Box is for many current gamers. 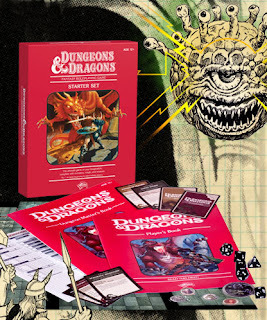 Second, they hope that the nostalgia some "hold out" gamer feel regarding the old Red Box will convince them to give the new edition of D&D a try and that the boxed set itself is of sufficient quality to win these hearts and minds. It should be noted that the similarities between the two boxed sets is more than cosmetic. While both feature the same inspiring Larry Elmore artwork on the cover, both products are also structured in similar ways with regard to how they present the mechanics of the D&D roleplaying game. Both the new Wyatt edition and the Mentzer edition use a "Choose Your Own Adventure" solo narrative as a method to introduce players to the concept of roleplaying and to the games mechanical systems. It was an innovation when Mentzer utilized it in the 80s, and Wyatt's design team have improved on the method -- if not on the underlying story. There were fewer "design" decisions for players in the Mentzer edition, but the story was more engaging in the older edition. Not to say that the new introductory narrative is bad, but it is "loose" and lacks a significant emotional punch. One doubts that players will be talking about Traevus the merchant in the same tones that older gamers mention Aleena the Cleric and Bargle the mage. But players of the Mentzer boxed set can't refer to the time they chose between casting a Freezing Burst at goblin raiders or whether they decided to cast Stone Blood which partially solidifies the blood of ones enemies. Both games have their good moments in presentation, and both are effective in presenting the mechanics and a style of play. Reading the new Red Box, as a 4e player who has been listening to the hushed rumors that this is a launch product for a 4.5 edition and that a 5th edition is only 2 years away, there were a couple of rules changes that jumped right out at me. These changes are purely from the Player's Book, the DM's book has some changes as well but those will be discussed in part 2. First, in Paragraph 8 (a Fighter paragraph) the text mentions that the Fighter's weapon damage is equal to the weapon die plus both the character's Strength and Constitution bonus. Huh?! Is this a new ability for all Fighters, is this a change to Charge, or is this an error? Second, I noticed that Humans now have an Encounter Power like all of the other races. The power is called "Human Versatility." While it isn't overpowered, it is a complete change to the human in the Player's Handbook. It isn't enough of a change to warrant 4.5 cries, especially given that it will be added to the "rules update" that is available for free online, but it is striking none the less. Third, the new build of fighter is interesting and demonstrates one of the changes that Wizards is promoting in the Essentials line. The new Fighter build relies more on his Melee Basic Attack than PHB Fighters, his "at-will Powers" are stances that modify his Basic Attack rather than attacks in and of themselves. I have to say that this is a thematic change that I like. This seems to fit in with the fiction that D&D emulates. Fighters do use "maneuvers" from time to time, but they are more frequently using tactics or styles and the new Powers reflect that thematic element nicely. They also make Fighters easier for new players to play than in the PHB where all classes required equal book keeping. I'll discuss more as I read through more of the class choices, but I can say that I am impressed with the presentation style of the product. Though it should be pointed out that this is very much an introductory product and that many experienced gamers -- who don't like reading through introductory style presentations -- will not find this product compelling. Though I am an experienced gamer, I am enjoying this presentation and find it to be far superior to the "Starter Set" Wizards released in 2008. It compares well to the first Red Box so far, though it doesn't quite match the Denning Black Box in my esteem. Though, to be fair, that would be quite a feat.